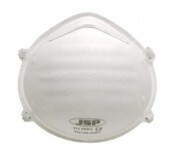 This FFP1 moulded disposable dust mask is a traditionally designed mask without a valve offering .. This FFP1 valved disposable dust mask offers protection against fine non-toxic dusts, fibres and .. This FFP2 disposable dust masks offers protection from solid and liquid aerosol variants. Confo.. These FFP2 valved disposable dust masks offers protection against fine non-toxic dusts, fibres an.. This FFP3 valved disposable dust masks protects against very fine toxic dusts, fibres and aqueous..
• Expanded filter area • Unique design reduces breathing resistance • Comfortable, lightweight off.. The 3M™ VFlex™ Particulate Respirator offers effective protection at incredible value with no compro..
Qualitative Fit Testing can be used on what are defined as tight fitting respirators, with the excep..
Our disposable dust mask range is designed to effectively and efficiently protect workers carrying out a wide range of different jobs. All of our products are produced specifically to ensure that all the masks provide comprehensive protection without inhibiting the performance of the individual. All of our disposable dust masks come in packs of 5, 10 or 20 and are suited to a range of different jobs where the workforce will be subjected to very fine toxic dusts, fibres and aqueous mists. At Manchester Safety Services we stock both valve and non-valve dust masks, allowing you and your workforce to choose the type of mask that will best suit the necessities and the job at hand. All of our high-quality stocked dust masks are ergonomically designed to sit comfortably on the face, making it easier for the workforce to breath without compromising their health. We also stock a Face Fit Kit, allowing all members of the workforce to discover the full and comprehensive measurements of their face and find the dust mask they are best suited to. This can help ensure that there are no potentially dangerous gaps between the face and the mask. The kit also trains the workforce in the correct way of fitting a mask, ensuring they are working to the fullest of their efficacy. The majority of failures by dust masks are a direct result of poor fitting or a lack of training. Call our dedicated sales team on 01706 364943 if you require further assistance with finding the right mask for your needs.